A 31-year-old man was arrested and released under investigation. An elderly woman’s bag was snatched by a motorcyslist as she got off a bus in Churuch Lane, Bedford, last Tuesday (30 January). It happened around 1.15pm in the alleyway between Church Lane and Pevensey Road. The victim had just got off the number five bus from in Church Lane and turned into the alleyway. She heard the sound of a motorcycle coming up behind her, so stepped out of the way to let it pass. 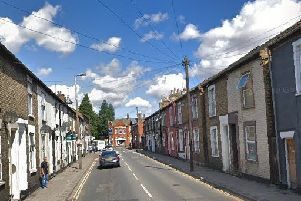 As she did so, the rider snatched her handbag and rode off towards Pevensey Road. The offender is described as white, in his late teens to early twenties, approximately six feet tall, and of medium build. He was wearing a turquoise blue fleece hoodie with the hood up and dark coloured trousers. Sergeant Simon Oldfield, investigating, said: “This victimisation of a vulnerable member of our society is not acceptable and this incident has left the victim very shaken. We are keen to hear from anybody who may have witnessed this incident. Please contact Bedfordshire Police on 101 quoting the crime number BP-30012018-0173, or you can make a report using the force’s online reporting tool.